"No, its fine. I don't get to talk much"
The above info came from GenoX and sugoiweb.com, and was edited by yours truly (contact me). 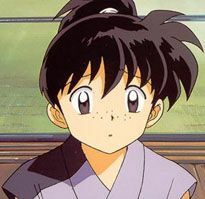 Kohaku is Sango's younger brother. Kohaku and the rest of his village was called to a castle to exterminate a Spider Demon. Naraku took over Kohaku's mind and killed his father. He is now Naraku's unwiling slave. Sango has promised to save him. In episode 153, Kohaku regains his memories, and he now wants to kill Naraku, even if it kills him. But he can't reveal any of this to Sango, because Naraku WILL kill him. I'm told Kohaku's name means "amber" in Japanese. 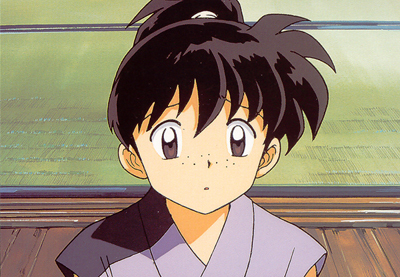 I'm told that in the episode where Kohaku dies (or possibly the episode prior) it is stated that he was 11 years old. Apparently his father said something along the lines of "Now that you're 11 you can come with the us the demon exterminators" right before they went to exterminate a spider demon that was being controlled by Naraku. I'm also told, however, than an official Takahashi newsletter gives Kohaku's age as 12 years old at the time of death. If you have additional information, please contact me. The above description came from GenoX, and was edited by yours truly (contact me).